Description - Available in both horizontal and vertical patterns, our Natural Bamboo Traditions flooring planks are certain to cater to any customers preferred look. 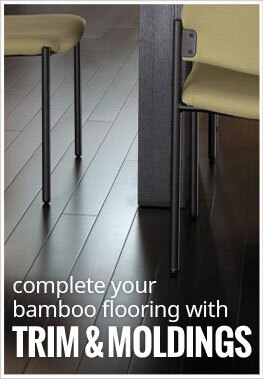 Offering a more traditional bamboo look, horizontal bamboo shows knuckles giving your floor a more distinctive look. Vertical bamboo offers a more subtle visual that is cleaner and more consistent throughout. Our natural bamboo floors are constructed with only the highest quality Moso bamboo, ensuring a floor that is both durable and long lasting. More comfortable than strand woven bamboo, our traditions bamboo planks are backed by a lifetime warranty. Size – Our bamboo floor planks are 3.78" wide x 37.81" long. Recommended Uses – Natural Bamboo flooring is more comfortable than strand woven bamboo and is great as flooring for bedrooms, in living rooms, as dining room flooring, as office flooring, in dens, as flooring in game rooms, and much more. Start first row with the groove toward the wall. Glue end joints of the first row by applying a small continuous bead of tongue and groove adhesive. Always maintain a 3/8” expansion gap between the flooring and wall and other fixed objects. Use spaces to maintain this expansion gap. Lay subsequent rows of flooring by applying glue to side and end joints fitting planks together with a tapping block. Remember to stagger end joints from row to row at least 8” apart. Note: Clean up any adhesive that is on the face of the floor by using a damp rag. DO NOT allow adhesive to dry on the flooring face as it is difficult to remove without damaging the finish. Make sure your subfloor is tested for moisture content and is properly prepared. Use an air stapler/nailer compatible with the profile of your flooring material. Test a sample to make sure it is. Lay the first line of planks inside the chalk line with the grooved edge toward the wall. Always leave at least a 3/8” expansion gap between the flooring and wall and other fixed objects. In order to affix the first rows, you will either need to face nail the planks or glue them. Once adhered, finish laying the subsequent rows by using a nailer/stapler to blind nail the top inside edge of tongue at a 45 degree angle. Nail each board every 8” and within 2” of each end. Remember to stagger the end joints from the row to row at least 8” apart. Use a tapping block to fit boards together. The last two rows will need to face-nailed, (or glued down) in the same manner as the first two rows. Note: It may be necessary to face-nail in doorways or tight areas where the nail/stapler can't fit. You can also glue down these areas as well. First spread the proper adhesive with the proper trowel over the floor. Once the adhesive has setup sufficiently, lay the first row of flooring with the groove facing the wall. When the first section is finished, continue to spread adhesive and flooring section by section. Use a tapping block to fit planks together. Use spacers during installation to maintain this expansion gap. Walk each section of flooring in order to make sure it is well bonded to the subfloor. Flooring planks on the perimeter of the room may require weight on them. Note: Use a damp cloth to immediately remove any adhesive that gets on the flooring surface. Available in vertical and horizontal looks. Endura AR® UV-Cured Aluminum Oxide finish. More comfortable than strand woven bamboo. Glue, Nail, Float or Staple. The bamboo floor is beautiful! Great product and seems very durable. This bamboo has a great look! I love the lighter color options! The bamboo flooring is perfect for our office. I love this color, it feels very school-ish and helps set the productive mood!